There’s an argument that comes up with predictable frequency when talking about satire. Let’s call it the Fight Club Stance, or if you want a less tired example, the Wolf of Wall Street Position. Proponents of these films argue that, for satire to truly work, for it to feel legitimately subversive, it needs to avoid an obvious, upfront approach with its criticism and seemingly embrace what’s being critiqued. This would include Fight Club’s depiction of the damage created by a violent masculinity, or the final ruin of Jordan Belfort due to his communion with the excess in Wolf of Wall Street. By seeding negative depictions of these actions within what looks like something that would generally celebrate the subject, goes the argument, you necessarily comment on and critique the subject matter. It’s not an argument without merit, but it runs into problems when it’s used to dismiss critique of a work’s depiction outright. It often disregards both the subtext and context which the work exists in. Without direct engagement or critique of a subject it’s easy to end up advocating for it due to values of society and the context it exists in. That’s why Fight Club ended up inspiring real life acts of imitational violence and ironically became a masculine call to arms. It’s why some people look up to the rich and charismatic Jordan Belfort of Wolf despite his actions clearly being those of a horrible human being. In a society that values a dominant masculinity and the accumulation of capitalistic power by any means, depictions of those actions can become aspirational. Combine it with a slick, hedonistic, Hollywood aesthetic and it creates an atmosphere of reverence for the subject that is ostensibly being critiqued. There’s a mentality here that believes if you exaggerate something to a large enough degree it will draw attention to its own absurdity. That’s not always enough, especially in a context where we are routinely taught to dismiss those ideas. Take for example the handling of Far Cry 3. While the lead writer, Jeffrey Yohalem, attempts to subvert tropes and stereotypes regarding violence, morality and race, the format of its presentation ends up reinforcing those harmful ideas. Yohalem insisted that by casting the player as a gun or tool of the Rakyat (literally meaning “the people”) and creating a white protagonist referred to as “Snow White” he created a subversion of the stubborn colonial tropes that have existed since the 19th century. But how many games have you played that cast you as “the gun,” as the tool for a greater machine’s aspirations? That describes the majority of shooters, including every entry of the Far Cry series itself. The “removal” of a character’s agency doesn’t make it any less of a power fantasy, especially when it’s already the basis of the genre. 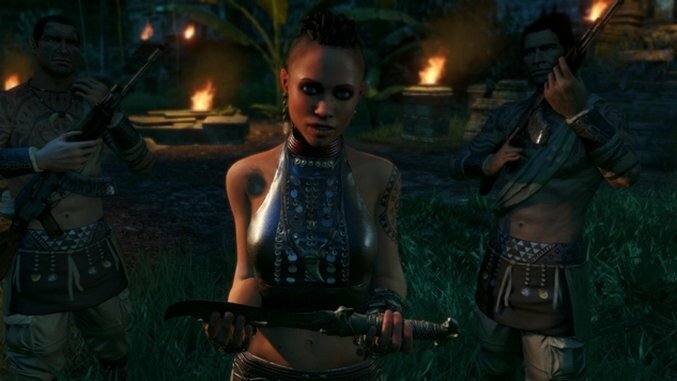 That failure to openly critique is even more galling with Far Cry 3 due to its racial politics. Yohalem’s depiction of the Rakyat play into the tropes of the savage natives, alongside the aforementioned title of “the people,” which only exists to further remove their individuality and humanity. As Yohalem says himself, “It’s the laziest name for a tribe ever, they’re not real, they’re a metaphor.” There’s more to say, but these are old arguments. What’s interesting now is how its pairing with the open world structure actually serves to continue to undermine its intention. Just as Metal Gear Solid V’s open world structures exaggerated the colonialist undertones of the game, a similar process occurs here. Far Cry 3 presents you with a gameplay loop of dominating a landscape, extracting its resources, and becoming more powerful by learning the rituals of the native people and outperforming them at it. By using this loop it rewards you for continually performing and engaging directly with those colonialist tropes. Even its attempt at subversion, by making the player a tool of the Rakyat, plays into those tropes, casting the Rakyat as mystical natives whose way of life corrupts the white protagonist and turns him against his white friends. It’s something Ubisoft obviously didn’t learn from, given that they believed they could swap out the race of the characters to remove the problem in the sequel. As Gita Jackson points out when talking about its box art, the villain’s portrayal is a romanticization of imperial power, something that carries over into the structure of the game itself. If anything, Far Cry 4 works to recontextualize and reveal the lack of understanding present in Far Cry 3. It’s the same process that occurred up to the release of Hotline Miami 2, where the sequel undermined whatever sense of subversion the designers may have felt present in the first game. Compare Maddy Myers’ opinions on the first Hotline Miami, in which she uses it as an exploration of violent masculinity, to her reaction after a preview of the sequel. It’s a reaction that was followed later by Nico Deyo’s thoughts on it, where she called into question if the original Hotline Miami was ever as clever as we thought it was. Myers and Deyo both speak to the zeitgeist of the original game, and how three years removed from it the desires and messages of Hotline Miami fall apart. Fight Club comes up consistently within these discussions as well. It’s unsurprising, not only because of its thematic ties to the metanarrative of Hotline Miami (violent masculinity, fans carrying on the work of the protagonist), but because it shares that film’s desire to both criticize and traffic in the tropes and philosophies of violent masculinity. Both ask you the meaning of the violence on display, with just enough to convince you that they might have something to say. Both also bask in the spectacle of it, filtering it through the glamorous production given to its peers. Hotline Miami brings a pulsing club bloodbath, like the opening moments of 1998’s Blade on a 30 second loop. Fight Club brings director David Fincher’s sterilized nihilism, affecting both exaggerated style and detachment at once—the aesthetics of cool applied to the object of critique. It’s why the people who these works are ostensibly critiquing often end up simply loving them. Without a clear position or awareness of outside contexts the meaning is left to the audience, and if that audience is predisposed to believe you agree with them it’s easy for them to take it as an affirmation of their beliefs. Knowing that, is it any surprise that fans are often driven to such passionate, even abusive, defenses of this media? This is, ultimately, the pitfall of satire. Satire, for better or worse, is forever rooted in the cultural moment that created it. For it to be effective, it requires intimacy with the subject that it targets. Sometimes that intimacy means we cut too close to the edge that separates satire from its subject. Often it is only with time that we can spot the difference. Omar Elaasar is a Chicago based writer, artist, and Editor-in-Chief of clickbliss.net. He can be found online as ‘siegarettes’ on Twitter, Medium, and Youtube.